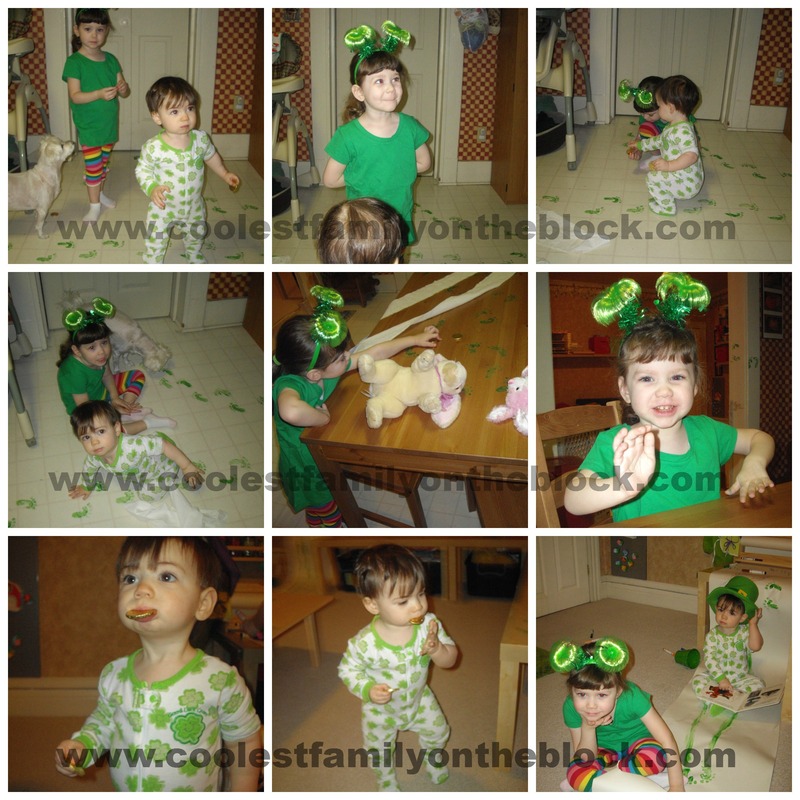 In 2011 we had a leprechaun visit our house for the first time. 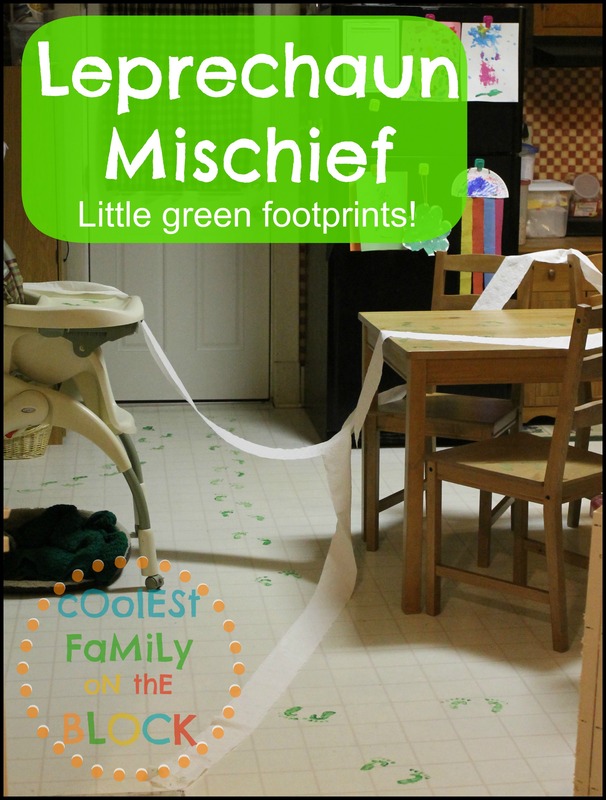 We woke up to find that he had left green leprechaun footprints all over our kitchen and laundry room, he’d turned the toilet water green, and made our milk turn green in the glass! The following year on St. Patrick’s Day I had a one month old baby and I’d ask Santa Claus (head of all legendary figures) to please keep the leprechauns away. Last year the leprechaun was back to his old tricks again! The leprechaun entered magically through the back door and then made his way into the laundry room where he hopped from the floor, to the washer, to the dryer, to the toilet, to the floor again, to the sink, and back out into the kitchen. Did you know that leprechauns hop? Well, they do. In fact they can jump really high straight up into the air making it easier for them to get into mischief. 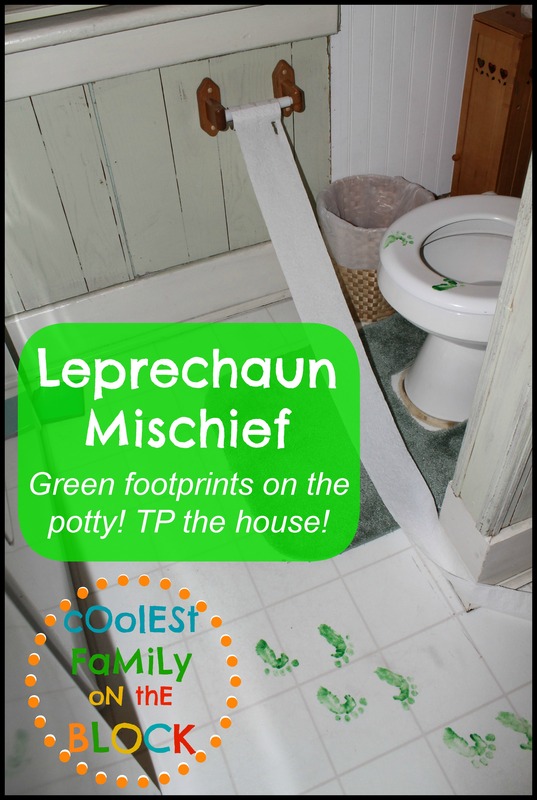 While hopping around the laundry room the leprechaun left his green footprints everywhere…including the toilet seat…and grabbed onto the toilet paper to tp the house! The leprechaun had unrolled the toilet paper all over the kitchen! When he left the laundry room the leprechaun hopped onto the highchair and over to the table where he must’ve dropped some gold coins out of his pockets while running in circles. Next he hopped down to the floor and onto the wall! 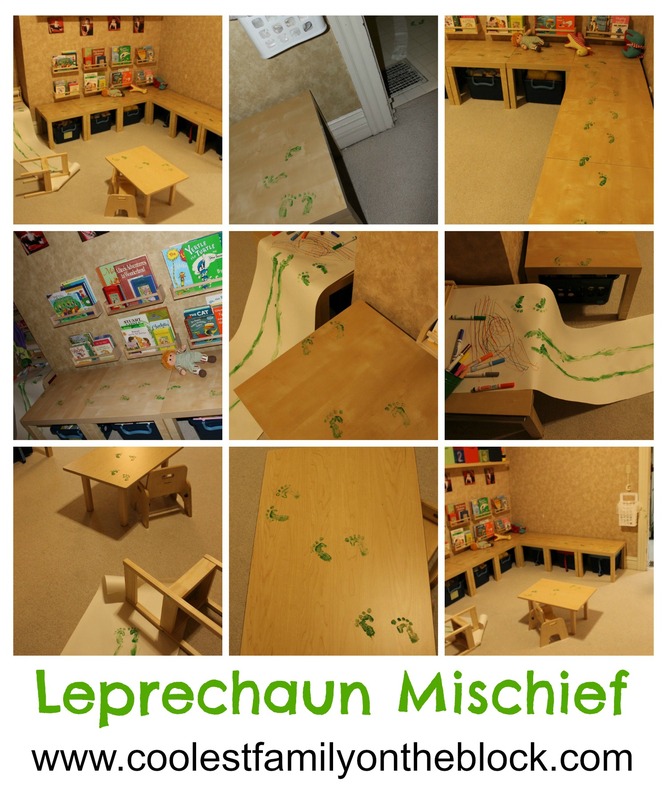 The leprechaun’s next stop was the playroom. We have tables lined up along the walls where the kids can sit and read books, build with blocks, or play with play sets. 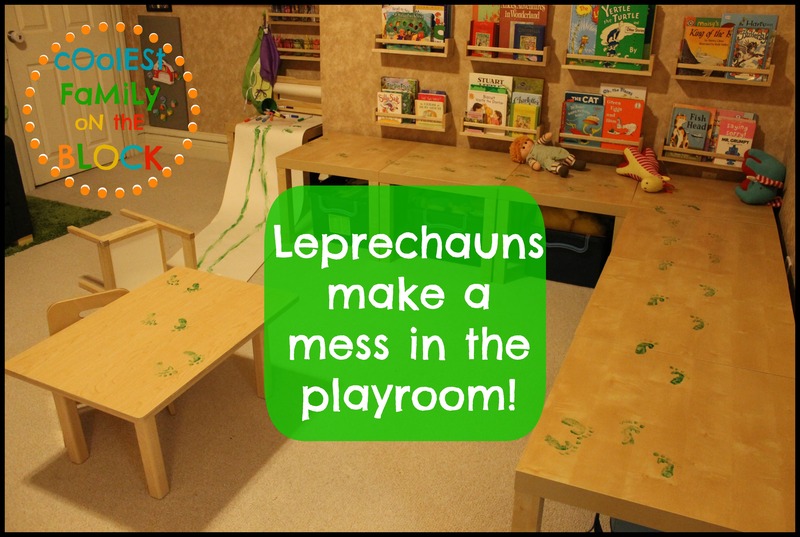 The leprechaun ran across the play tables to the art table. 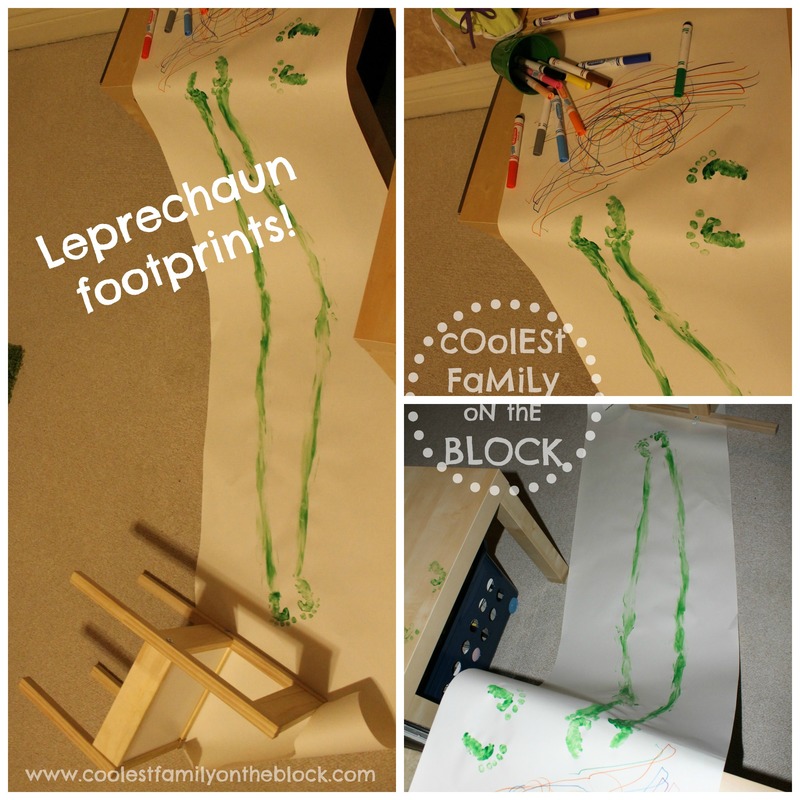 The leprechaun unraveled paper onto the floor and scribbled a picture. 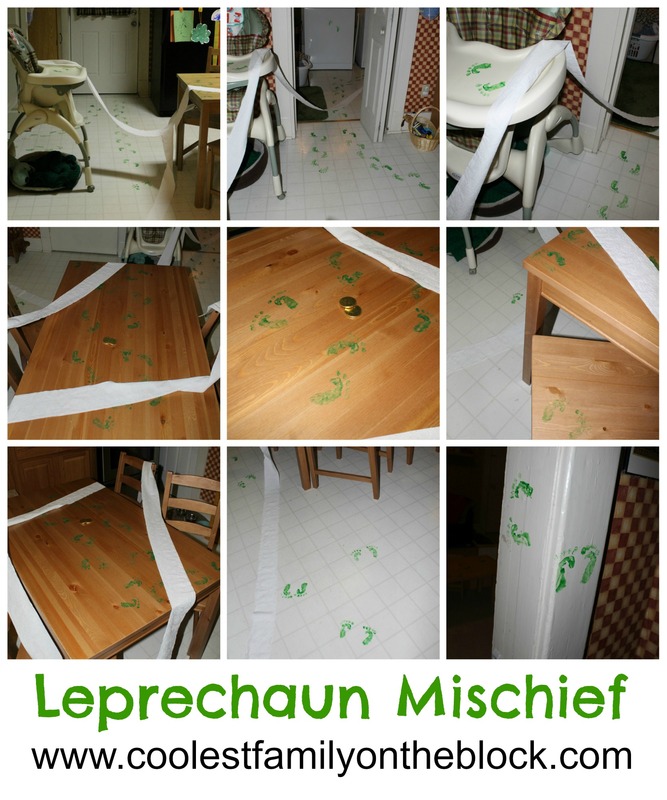 Next the leprechaun slid down the roll of paper and hopped onto a table in the middle of the room before going back to the kitchen where he left through the back door. 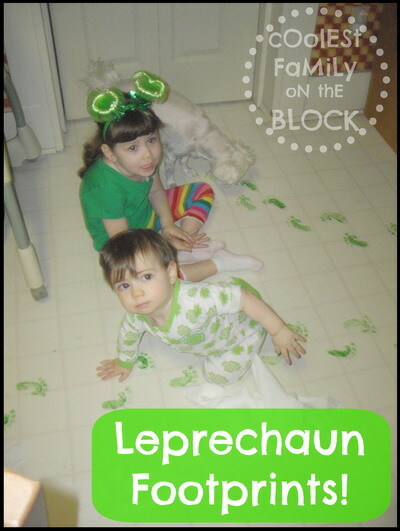 You can see the mess that the leprechaun made in 2011 and all of the mischief he got into by clicking the photo below. Has a Leprechaun ever visited your house? I’m not sure what it is about our house but legendary figures are always leaving messy footprints in our house after a visit. First Leprechauns, then the Easter Bunny, and now…Santa Claus! For the past two years Santa has magically descended our non-functioning chimney and left his sooty boot prints on our carpet on his way to the Christmas tree. In 2011 Santa left a trail directly to the tree. He must’ve ran out of soot on the way back. But in 2012 Santa wasn’t quite so neat. He left footprints everywhere…what a mess! Luckily Santa’s boot prints vacuum up quickly and easily. …and we noticed something interesting. 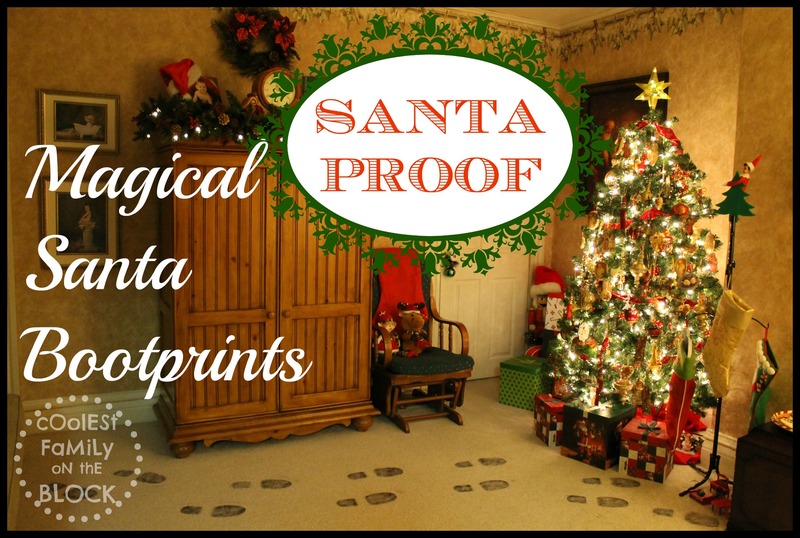 Santa’s boot prints are truly magical indeed, in fact they change while he’s walking! Every so many steps he would leave a “Ho Ho Ho” or “SC” foot print behind. In some homes Santa leaves white snowy boot prints with magical North Pole snow that doesn’t melt. For us, it’s soot. I’ve also heard reports from some families that get reindeer hoof prints inside their house! I guess it’s a good thing that we set our oats and carrots for the reindeer out on the back porch. 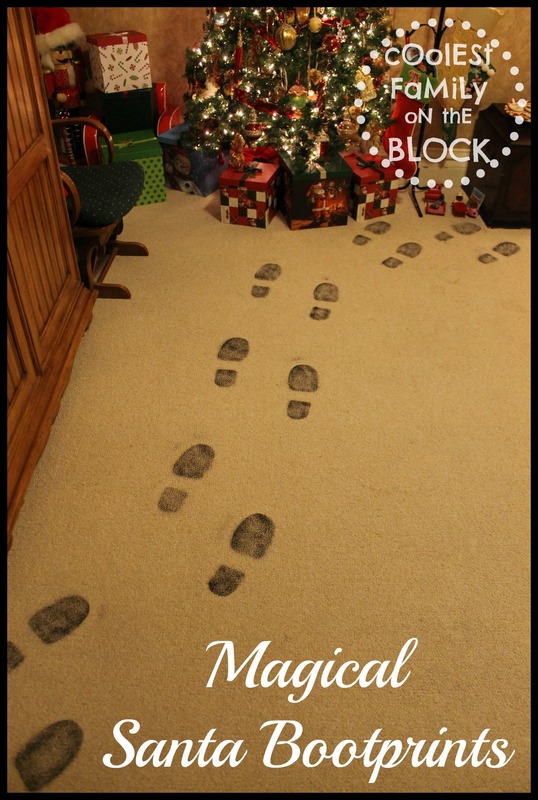 Santa Soles allow you to create Santa’s footprints in your very own home, adding to the magic of Christmas morning. Santa Soles are the footprints that dreams are made of! Santa Soles are templates that allow you, along with our non-toxic, non-staining “soot” to create Santa’s footprints right in your home! Our “soot” is safe for use on all types of flooring and vacuums up easily, making clean up a breeze! Disclosure: I found, purchased, and reviewed the product “Santa Soles” and the additional boot print templates on my own. 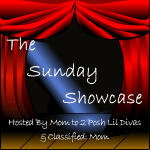 I was not given the products for free, I was not compensated in any way, and I was not asked to post a review. All opinions expressed are my own. Does Santa leave boot prints in your house? For the third year in a row the Easter Bunny left white paw print tracks all over our family room (which is now the playroom). The kids had to follow the bunny trail to find their Easter baskets. The Easter bunny hopped in through the window just like he did in 2011 and 2012. This year he hid Jonathan’s Easter basket inside of the play kitchen. The Easter bunny hopped all over the playroom leaving his footprints behind. He even hopped onto the table to get a closer look at Adaline’s stuffed bunny. Then the Easter Bunny hid Adaline’s Easter Basket under the art table. Adaline searched for both Easter baskets since Jon is 14 months old and was not very interested in the whole thing. Adaline was so excited about the Easter Bunny’s footprints being everywhere, she just kept running around in circles pretending she was bunny! The kids enjoyed inspecting the Easter Bunny paw prints closely. Does the Easter Bunny leave paw prints at your house? Does he hide the Easter basket? 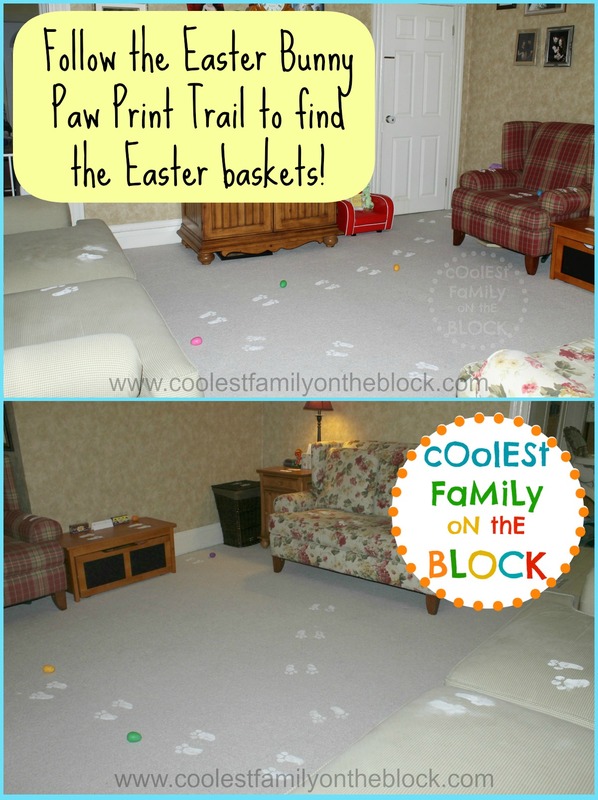 The Easter Bunny visited and left a messy paw print trail all over the family room again! The bunny hopped in through the window and onto the sofa before hopping off to hide the Easter baskets. He hopped straight ahead and hid Jonathan’s Easter basket near the chair. The Easter Bunny’s paw print tracks led to Adaline’s toy basket in the corner of the room where he hid her Easter basket. …and then he hopped across the room again. And finally he hopped back onto the sofa and out of the window the way he came in. 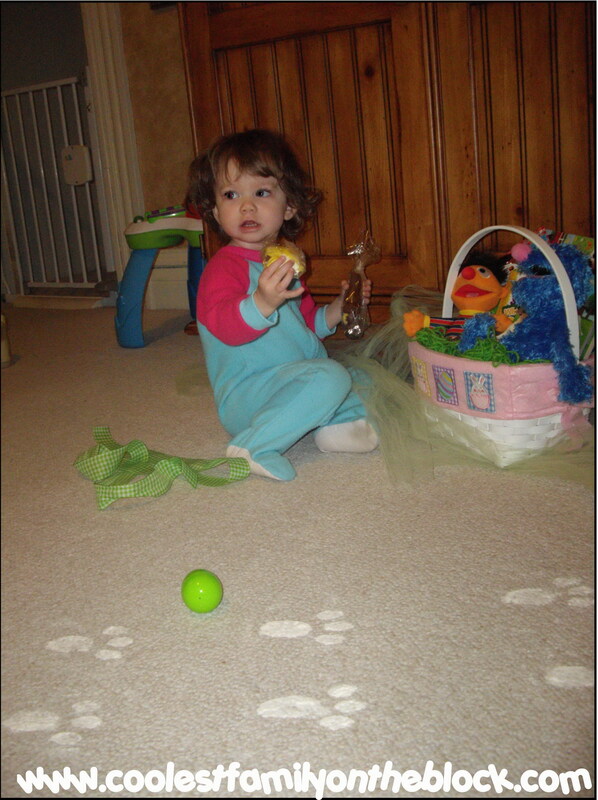 Last year on Easter we woke up to find that the Easter Bunny had left bunny tracks in the family room! At first Adaline was a little afraid of the bunny footprints which is odd considering that she didn’t seem to mind the leprechaun footprints at all. It looks as though the Bunny hopped in through the window and then hopped across the room to fill Adaline’s Easter basket leaving a trail of bunny prints behind. He also dropped some plastic eggs that had candy in them. Adaline enjoyed putting them in her basket once her fear of the bunny paw prints mellowed. Adaline’s bunny and book about Easter was waiting for her. Don’t worry about the bunny prints…they vacuumed right up! 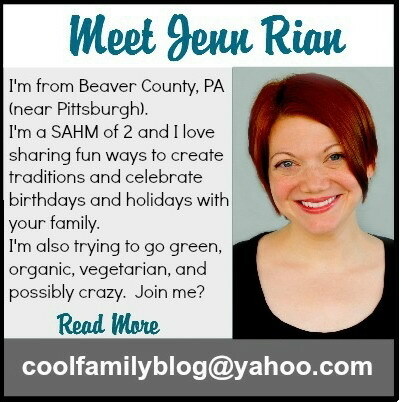 In fact, I’d say they were as easy to vacuum as flour, baking soda, or baby powder ;)! If you need a template you can try this one! Does the Easter Bunny leave paw prints at your house? Let me know in the comments! 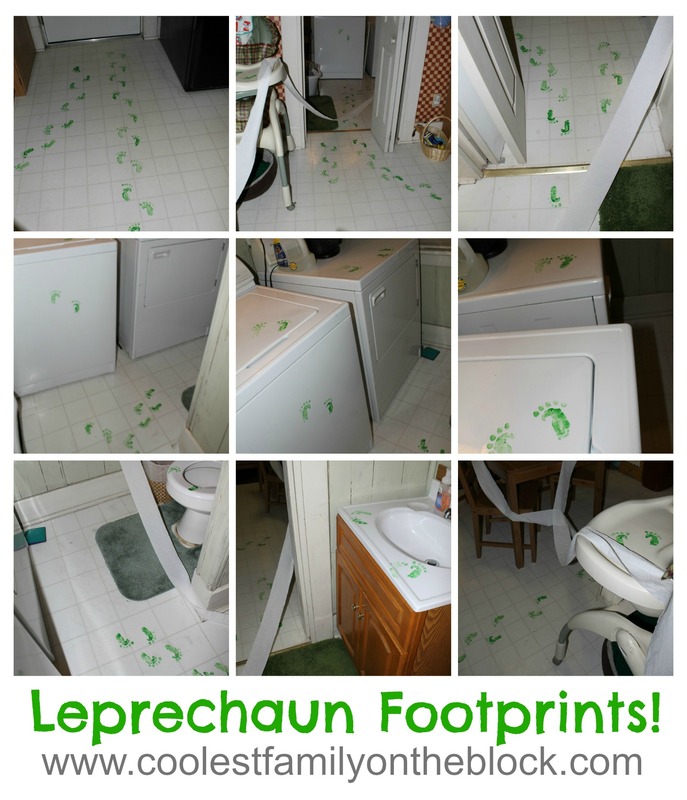 *Leprechaun Visit 2011: Leprechaun footprints and green toilet water! 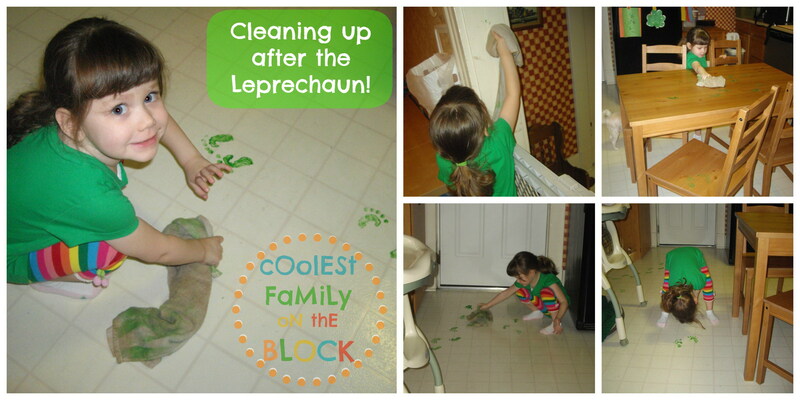 *Leprechaun Visit 2013: Little green footprints! 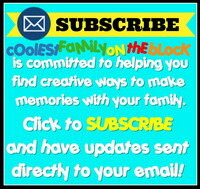 *30+ April Fools Pranks You Can Play on Your Kids!